The computing infrastructure as a service offered by Amazon Web Services (AWS) may have originally been conceived as a resource to support their own electronic commerce business but other striking applications emerged. Netflix toppled Blockbuster and transformed the way we consume video atop the AWS infrastructure. Dropbox changed the way we store and share digital resources by building on AWS. My company Crowdmark leverages AWS to store and serve images of student work for evaluation by graders and further analysis. Recently, the Google Cloud Vision API, the IBM Watson Developer Cloud and the Receptiviti.ai API started offering artificial intelligence as a service available for purchase like a utility. These resources may form the foundation for a new era of technological metamorphosis. 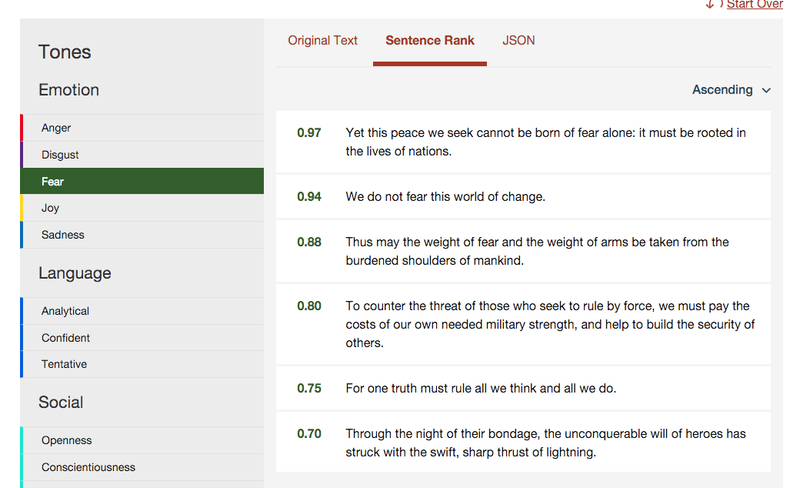 I wondered whether text analysis might generate useful insights for Crowdmark or other applications so I performed some experiments. 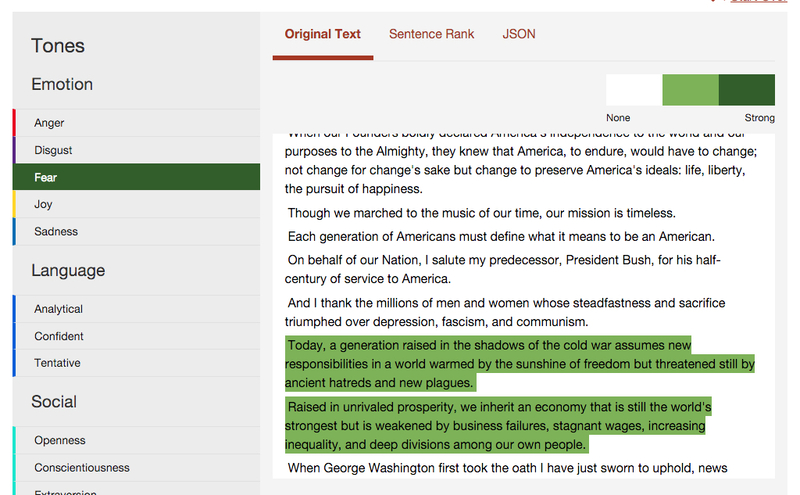 I ran the texts from inaugural addresses by four presidents of the United States through some text analysis tools I found online. 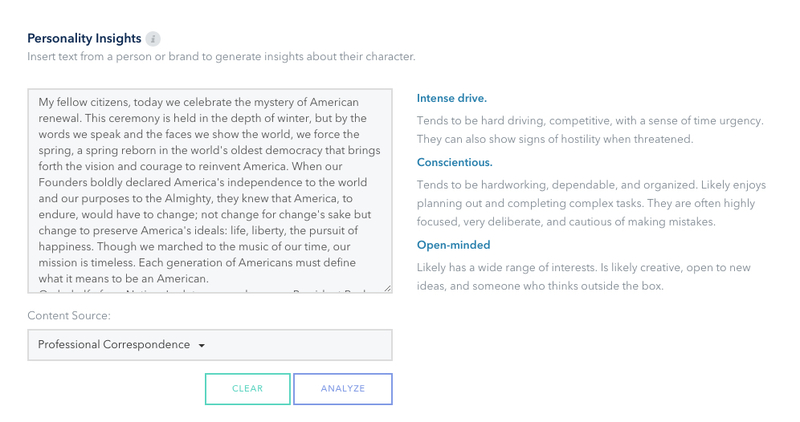 The IBM Watson Tone Analyzer uses “cognitive linguistic analysis methods” to measure the emotional tone in text. 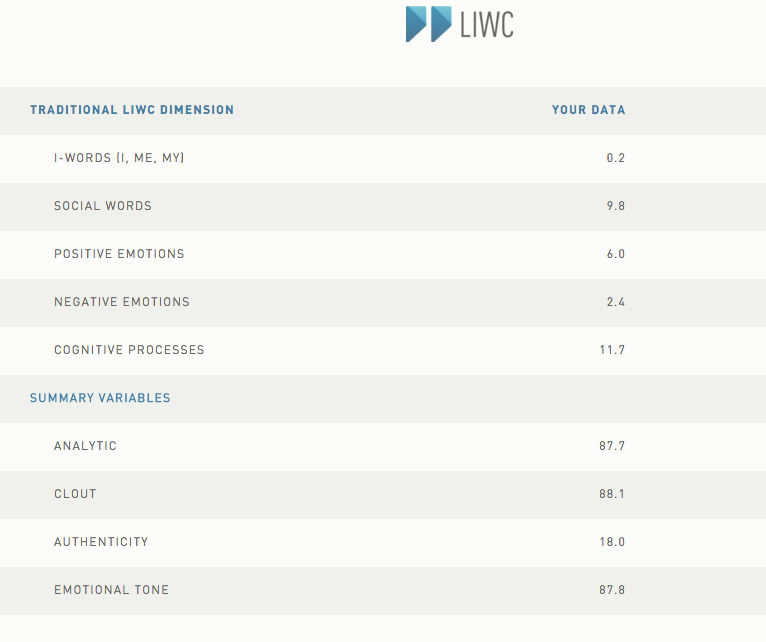 The Linguistic Inventory Word Count (LIWC) is a computer text analysis tool developed and psychometrically validated by James Pennebaker. Receptiviti.ai is a Toronto-based startup that offers text analysis as a service based on LIWC and other technology. 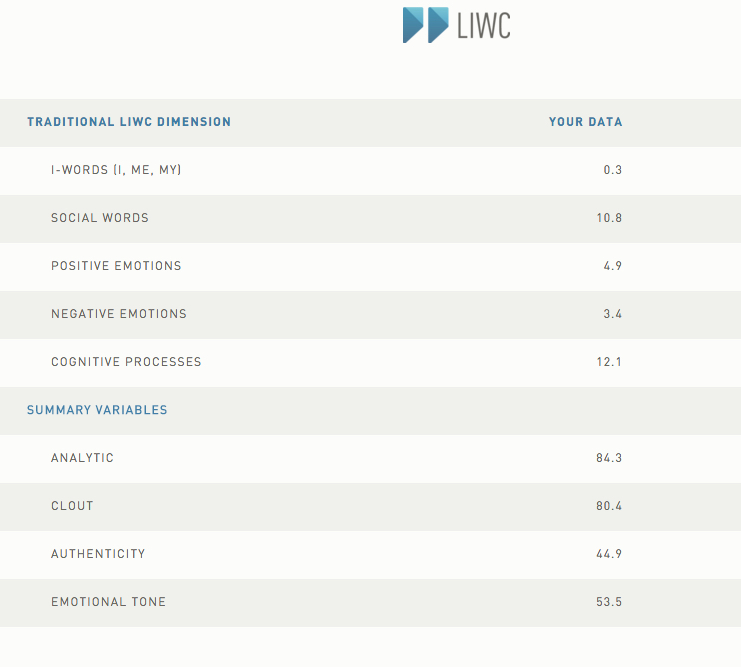 Screen captures of the results appear below. 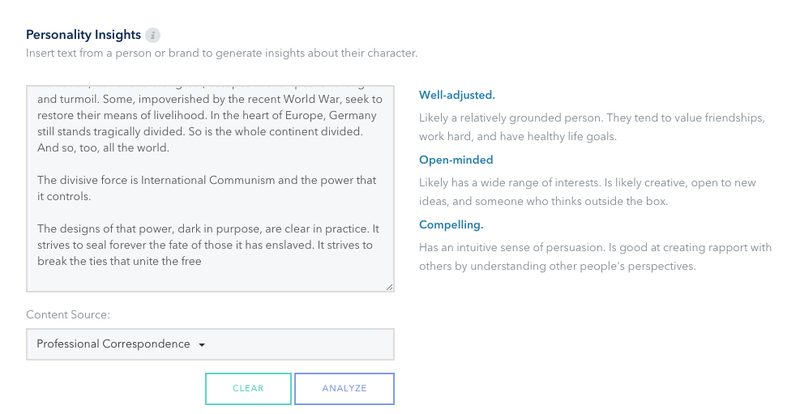 The IBM Watson Tone Analyzer results are exposed within an intuitive and interactive user interface. The results do not correspond well with my own emotional response reviewing the videos or reading these speeches. 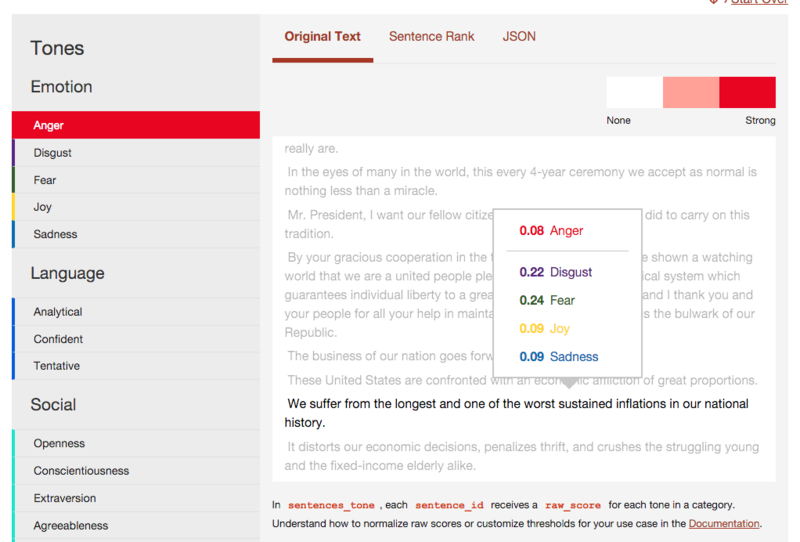 Based on these experiments, I am not convinced that Tone Analyzer will generate useful insights into the emotional characteristics of text. 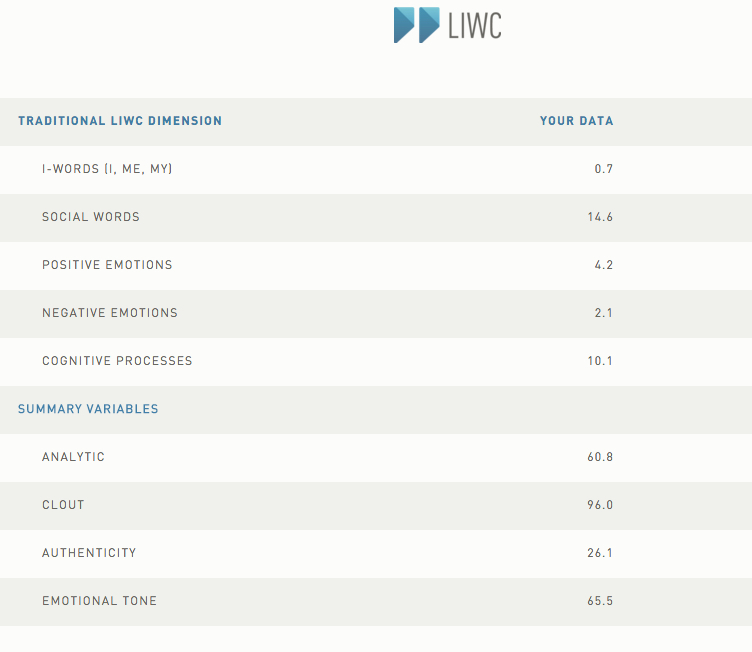 Based on what I observed, there appear to be too few dimensions of emotional tone generated by Tone Analyzer for it to drive improvements to the dialogue between instructors and students. There may be a rich superset of output measurements not exposed in this free demonstration. 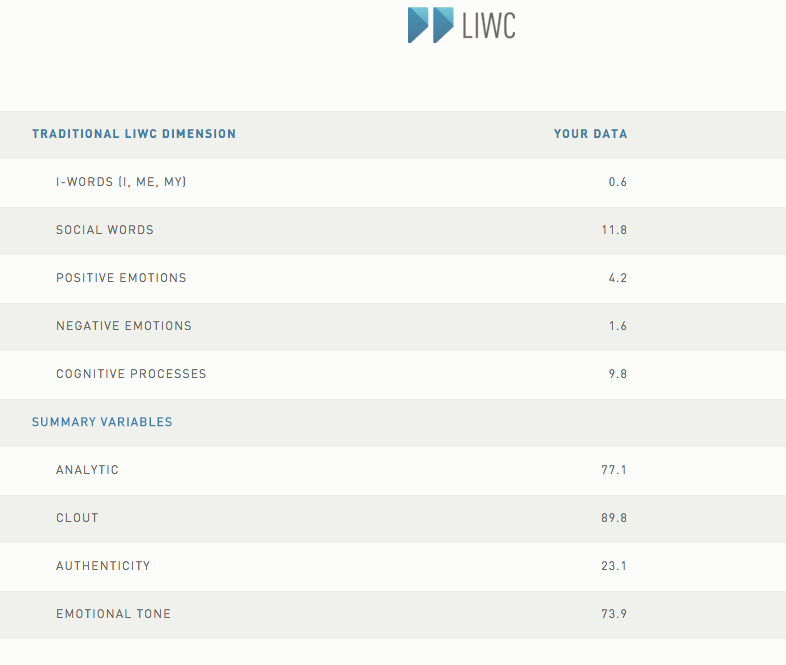 The LIWC results exposed through this free sample analysis are a small collection of the many dimensions measured by LIWC. It is not easy to glean insights into the speaker’s personality or their emotional tone based on the reports externalized in this free demo. 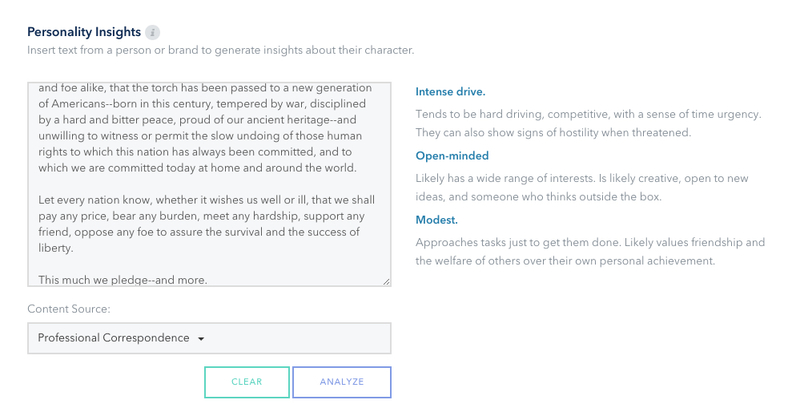 Short text descriptions of personality traits of the speaker emerged in the results from Receptiviti.ai. I found the text descriptions interesting but with limited precision in describing the speakers. I’m curious to know whether the personality decription accuracy increases with larger text samples from the same speaker. Files of various types (text, images) may now be sent to increasingly sophisticated online analysis engines poised and ready to extract data and return insights to the sender. What will your robot assistant read for you tomorrow? 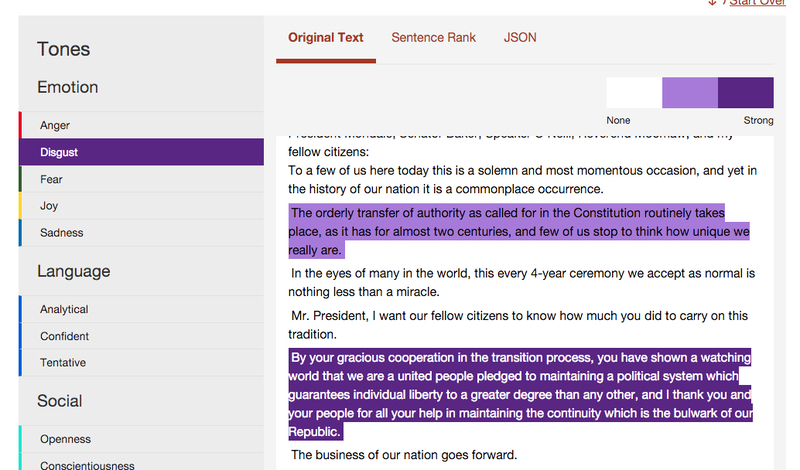 Moving the mouse over portions of the text reveals the results of tonal analysis of the highlighted paragraph. 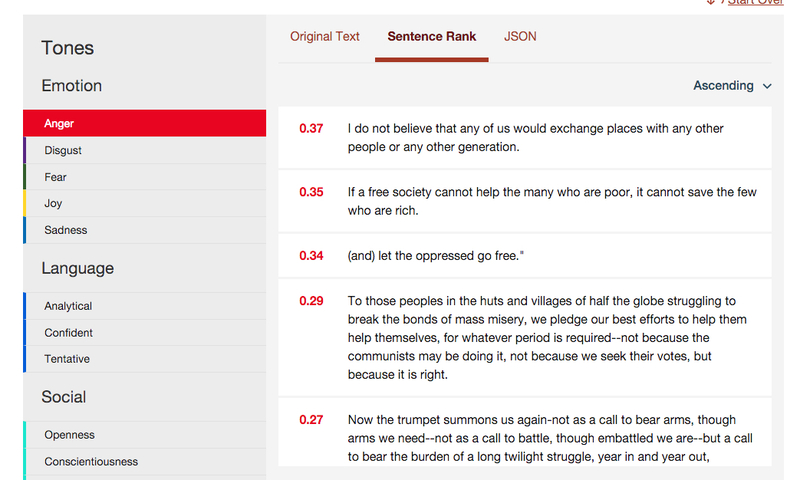 Tonal dimensions can be highlighted and sentences can be ranked based on tonal strength. For example, here is the sentence ranked highest for Disgust. 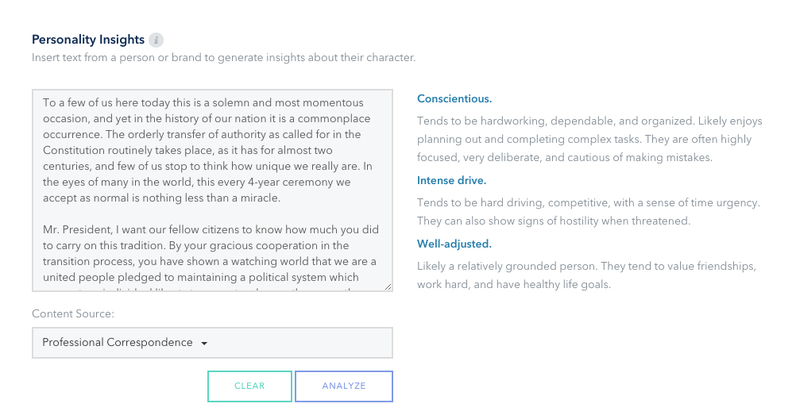 Tone Analyzer reports that Clinton’s speech is most dominated by Fear.